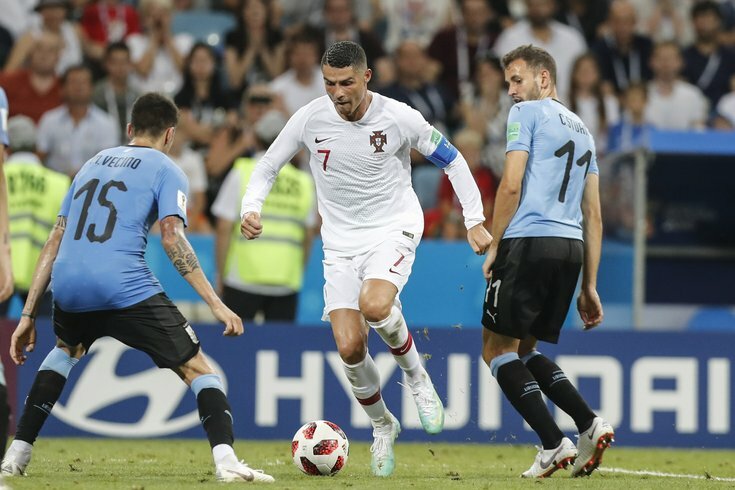 Portugal player Cristiano Ronaldo, in white, controls the ball against Uruguay players in the round of 16 during the FIFA World Cup 2018 at Fihst Stadium. Cristiano Ronaldo’s has transferred from Spanish club Real Madrid to Italian club Juventus, which will play in Philadelphia on July 25. It's unknown whether Ronaldo will join his new team in time for the match at Lincoln Financial Field. The biggest soccer star in the world has changed teams … and this impacts Philadelphia? No, the Union haven’t pulled off the move of the century. Cristiano Ronaldo’s long-rumored transfer from Spanish club Real Madrid to Italian club Juventus was made official by his former club Tuesday afternoon. Juventus is scheduled to appear in an exhibition match at Lincoln Financial Field on July 25 against German club Bayern Munich as part of the International Champions Cup. Whether Ronaldo will accompany his new team on the trip, or set foot on the pitch, remains to be seen. Ronaldo made his decision fresh off a stellar individual showing at the World Cup. He scored four goals in four matches with Portugal, including a hat trick in the team’s first game of the tournament against Spain. Three years ago, rumors cropped up speculating Ronaldo would be heading to the United States for a whole different reason this summer: to join an MLS club. Sports Illustrated’s Grant Wahl cited a source saying it was “likely” Ronaldo would come West when his contract ended. Instead, Ronaldo is showing no signs of slowing down, and if he manages to end up in the Juventus lineup in late July, Philadelphia will get a taste of a generational talent still in his prime.